They say water is life. If this is true, it will be appropriate to emphasize that good quality and potable water is life, not just water. As a matter of fact, water-related diseases are a reality and they are common in Cameroon, especially in the rural area. This is mainly due to the scarcity of good sources of water supply, of the unawareness of water treatment techniques, and the inobservance of hygiene measures by rural dwellers. As a result, CADAC has embarked on a journey to support the country efforts to eradicate the prevalence of water-related diseases like Typhoid, diarrhea, dysentery, and cholera amongst the locals. So far, we have conducted various sanitation education campaigns and provided water wells to several communities all over the country, more specifically during our medical outreaches in the Northwest, the Southwest, the Littoral, the East and the Center Region. Recently, we have in partnership with Bread For Life International, and with the support of the Japan Water Forum (JWF), implemented the ‘Water For Life Project’ Nkum-Ekie in the locality of Ngoumou in the Center Region (2017-2018) to the benefit of the local Health Center and the surrounding neighborhood (20 Men, 38 Women, and 121 youths and children). This has been an occasion to better our fight against water-related diseases, as we have conducted an in-depth seminar on ‘Water-related diseases and their socio-economic impact’ in order to make sure parents and children understand the burden of consuming dirty water on their education and finances (21 Men, 36 Women and 50 youths and children participated in this). The demand for such activities is urgent. We continue to look for other opportunities and partnerships to support our efforts in the Water, Sanitation, and Hygiene (WASH) field. The lack of adequate water and sanitation facilities in most cities and rural communities across West-Central Africa has led to health issues such as diarrhea, cholera and other related diseases. Clean water is vital for security and development. 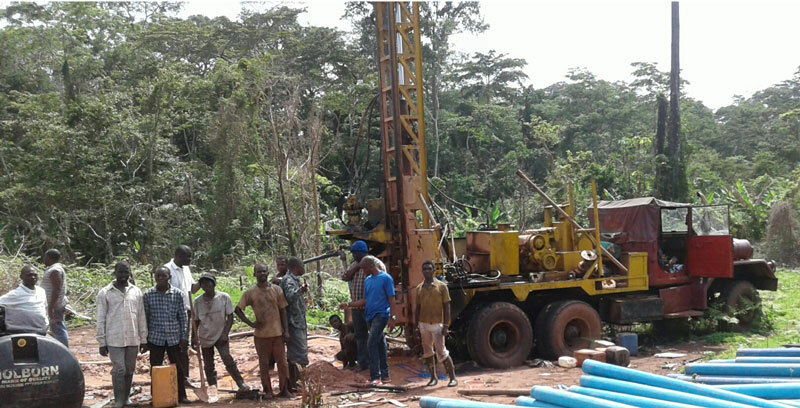 In Cameroon, cost of $6,000 to $16,000 are currently being charged for the drilling of a single well. Our partner Bread for life Intl. has embarked upon a mission to purchase well drilling equipment. In addition to drilling wells for irrigation on our farms and bases, wells will also be drilled in communities and for individuals across our region for a fraction of the current cost. This project also offers some valuable vocational training.